Whatcha gonna do, brother, when the red and yellow runs wild on YOU?? I am a bit ashamed to say that I forgot all about this particular miniseries, even as I clearly recall being interested in it when I saw it in Previews some weeks ago. The timing of the whole thing struck me then, as it does now, as a bit odd, having what was clearly meant to be an Iron Man crossover event thingy during the same summer that Iron Man was serving as one of the major players in the Capital-E Event storyline of the year, Fear Itself. But I have to say I’m charmed by this story, and it plays well with time-travel. Tony Stark, having been soundly beaten in the past, lets the world catch up with him, spending years in exile as his contemporary self goes through whatever he goes through, all the while building his own version of Doom’s time machine. There are five separate and distinct timeframes in this issue, and writer Rob Williams plays with them ably, moving back and forth with ease and clearly identifying when and where things are taking place. …And The Downside As Well. As someone who “read the original issssssuuuues” back in the 1980’s, I am troubled by several aspects of the art in this issue. 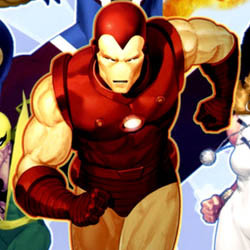 First and foremost, I don’t think that these costumes (Dazzler in her original plunging neckline, the Mark IV Iron Man armor, Power Man and Iron Fist in classic tiara and disco collar, Captain Britain in his classic Alan Moore era white-with-Union-Jack uniform, and the Human Torch in his red variant outfit) were ever simultaneously worn. That I can forgive, but penciler Rebekah Isaacs never quite nails the details, leaving all the characters feeling somehow unfinished. Iron Man successfully builds his time machine with the help of Hank Pym (who would have been in his post-disgrace exile, an interesting touch) and gathers his team from the timestream to attack at the very second that the world was destroyed in his original timeframe. Fighty-fighty, “I am power incarnate!”, heroic sacrifice by Cyclops blah blah fishcakes and things are quickly wrapped up. 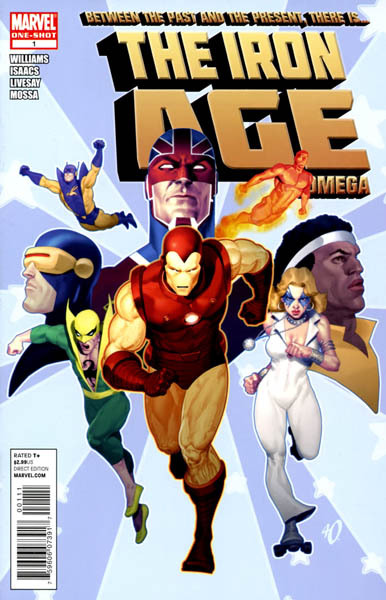 The actual resolution of the storyline is the least satisfying part of the issue, being much less cool than the idea of a secret team that happened between panels thanks to Iron Man and time travel, and the ending sequence where the grown heroes assemble in the present day turns out to be both inspiring and touching, as they remember their fallen friend Johnny Storm. The Verdict: Not What I Expected At All. In the back of my head, I think I had the assumption that this would be a forgettable trifle, a nostalgic way to put some of Marvel’s best historical costumes in one room and move a few hundred thousand books. I didn’t expect it to feel epic, or touching, or to be as entertained as I was at the ending. The ideas here remind me of the 80’s comics that they’re inspired by, stories like X-Men/Alpha Flight or Avengers Vs. The Fantastic Four that don’t have anything to do with the current big stories, but are arguably better remembered years later than the monthly grind stories themselves. There are some pretty marked issues with the art (Captain Britain especially gets the short end of the stick) and only Dazzler gets any meaningful facial expressions in the issue, but a fun little story makes up for a multitude of sins. The Iron Age: Omega #1 surprised me in the best possible way, and I will be seeking out the other issues of this story, as this one earned a very impressive 3.5 out of 5 stars overall, even though I didn’t care for either cover or interior art. Faithful Spoilerite Question Of The Day: Remember how cool is was when both Dazzler and Iron Man had super-roller-skates? Matthew let me know if you would like the first 2 issues of this story i would gladly give them to you because I didnt like them personally. Unlike you i started to read comics in the early 90’s when New Mutants became X-Force so there was no fondness for days of yore. The original Airwave was the skatiest! Those costumes weren’t ever worn simultaneously, which is the point. Tony was jumping around in time in the previous issues, wasn’t he? I thought he recruited the heroes from different time periods. I thought he recruited the heroes from different time periods. Ahh… Well, that would make a difference… Like I said, I missed the earlier issues, even after I intended to buy ’em. I actually thought the bookends of this story (Alpha & Omega) were by far the weakest. I think the story in them is enslaved to the set-em-up and knock-em-down aspects that are required of bookends. It was the middle stuff that shined for me. The issue with Power Man & Iron Fist felt especially like an old-school PM & IF story, which is great for us fans of that era. The Dazzler story was pretty nifty too. Anything that gives Dazzler a chance to shine (bwahaha) is A-OK by me~! ^_^ I think I will be picking this up, in the trade-format! Time-travel + Tony Stark + Old School Power Man&Iron Fist + Dazzler = Epic Awesome.